If you were responding to an accident and came across a vehicle powered by LNG (liquefied natural gas), would you feel able to intervene? Alternative fuel vehicles (AFVs) are more common than ever on TN’s roads and highways, and it can be difficult to keep up with quickly-changing technologies and safety procedures. Liquified natural gas (LNG): UPS has almost 300 LNG tractors that operate out of Knoxville, Nashville and Memphis in a spoke and wheel fashion. Propane autogas (LPG): The City of Kingsport alone has roughly 100 propane-powered vehicles, including many police cars! 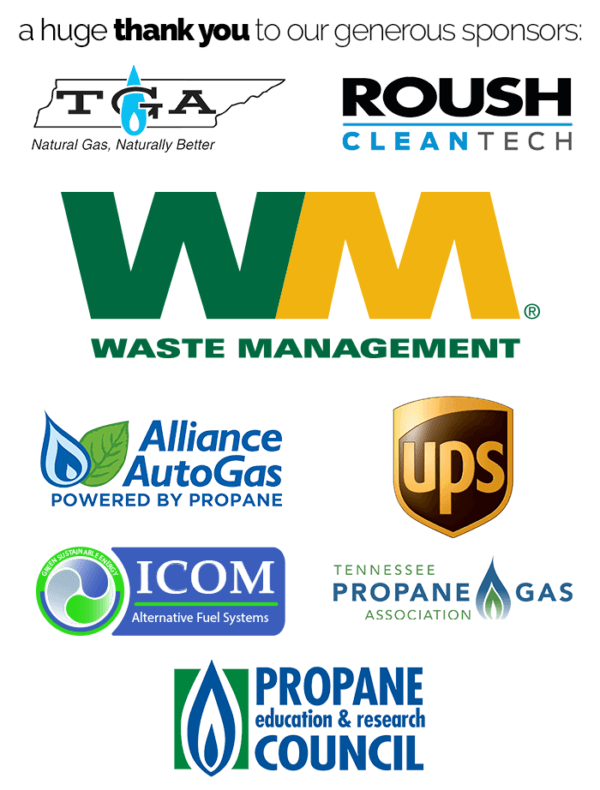 Compressed natural gas (CNG): Waste Management has over 100 CNG refuse trucks in Nashville, 20+ in Jackson, and a growing CNG truck fleet in Knoxville. Electric: The city of Nashville now has 13 heavy duty mass-transit buses that are all electric, and Tennessee as a whole now has almost 6,000 light-duty electric vehicles on our roads spread throughout the state. Tennessee Clean Fuels wants to ensure that all of our talented First Responders in Tennessee have the training they need to respond to incidents involving AFVs effectively. In partnership with the National Fire Protection Association, TNCleanFuels is pleased to announce two First Responder Training Sessions for Alternative Fuel Vehicle Safety that will take place in July 2019. Thanks to our generous event sponsors, we have been able to secure enough funding for these sessions to ensure that the costs remain affordable for First Responders in all situations. Event details are all provided on the right-hand side of this page. Date, time, location and the registration page that has more information are right there. The NFPA’s AFV Safety Training Program has reached more than 220,000 emergency responders to date. Their subject matter experts & instructors collectively offer more than 100 years of fire service experience, and have extensive instructional experience in the area of fire service tactics for AFVs. The program includes instructor-led classroom training as well as self-paced online training utilizing highly-interactive learning modules. The curriculum addresses electric, hybrid, and gaseous fuels such as CNG (Compressed Natural Gas), LNG (Liquefied Natural Gas), and propane autogas. Each session also features a live demonstration with on-site AFVs, and lunch will be provided for each session. Attendees will be able to include in-session time towards continuing education credits (specifics TBD), and will leave with the ability to train others at their organization about AFV safety. The sessions will be held in Nashville and Knoxville and will provide a full day of training addressing First Responder safety for working in and around alternative fuel vehicles.